Recognized worldwide for soccer, samba, and beautiful beaches, Brazil has emerged as an economic leader in Latin America. As a nation of contrast, diversity, and rich cultural heritage, Brazil offers a unique experience to all. Known for their welcoming nature, Brazilians are experts in enjoying life to the fullest and celebrating the influences that shape their history and vibrant culture. 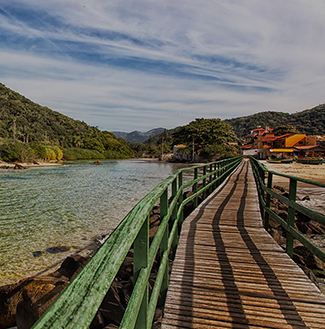 "Florianopolis is the place to go for a cultural experience." "I learned so much from this experience from education to living in a different country. It was an extremely rewarding experience." "ISA will allow you to experience new and exciting things while abroad. For those who would like a change of pace from the American way of education; study abroad! It will impact you and allow you the opportunity of self-growth that you may not find if you choose not to study abroad." "ISA offered a perfect amount of activities, excursions, and free time in a different country. There was a little bit of everything you could have wanted all wrapped up into one perfect learning abroad experience." "Overall, I am extremely happy to have chosen ISA and come to Brazil! If you have even the slightest inkling "of a desire to study abroad, just do it, because it'll be worth it! If you come during the summer, stay with a host family so you make at least one connection while you're here, but if you can you should totally go for a semester or academic year!"